It's not everyday you get a staged/halfway decent photo from me and my quickly failing iphone. Today's the day! The light was right and the scenery almost perfect. Nothing like red and white quilts on a cold, snowy day. Perfect for winter and an upcoming holiday. I got some emails yesterday that Farmhouse Reds are shipped and on the way to me and to your local quilt shop. My boxes will land on Thursday morning and that means some kits can be out to you as soon as Friday. There will be limited kits. It looks like it will be impossible to re-order :(. 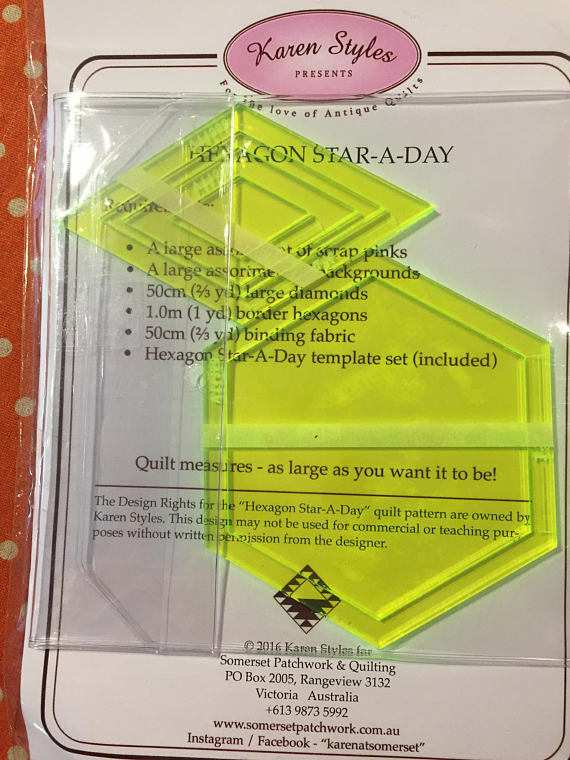 But - I do plan on having a few of each of these kits. This first one is called Mrs. Rose's Best and I love it's stunning, yet simple geometry. You can find the kits HERE. This is my On The Plus Side made with Minick and Simpson red and cream scraps. 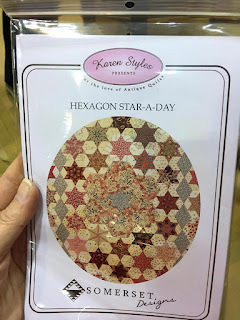 Your kit will be all Farmhouse Red fabrics and you can find the kit HERE. 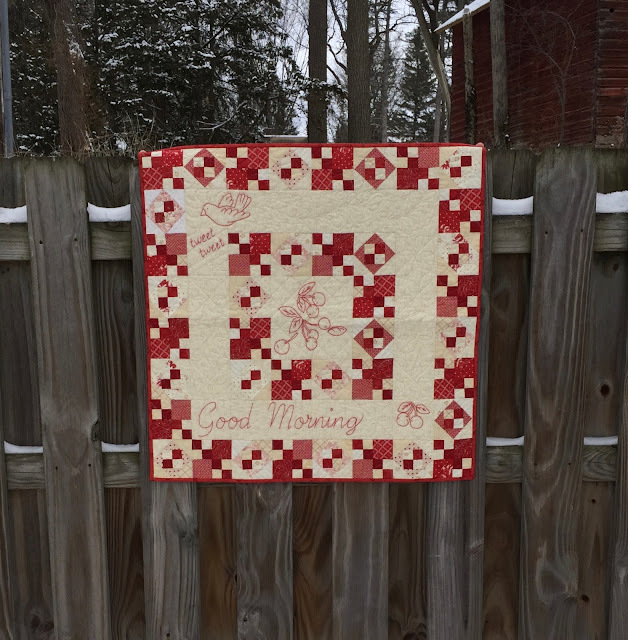 This happy little wall quilt or table topper is called Good Morning is has easily pieced blocks and redwork. You can find it HERE. Last, but not least is Bird Hills Lane. 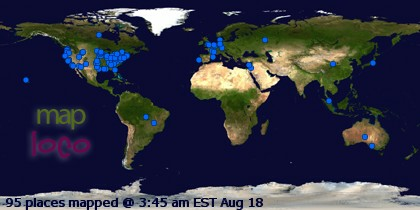 I don't have the quilt right now as it is touring the continent :) - but I have a photo from this summer. This was so much fun to make - a snappy little checkerboard and lots of over-the-top applique. It's on the small side - so a very doable project. You can find it HERE. Keep warm everyone (and keep cool those of you down under). Are you hibernating like me? Because of the weather? Because you are feeling under the weather? (I hope you're feeling great). This time of year emphasizes my natural inclination to snuggle in and do hand work. If it's by a roaring fire - all the better. I will have to get by with Netflix and Acorn tv. If you follow me on Instagram you saw that one on my long running projects (there are several, of course) was finished up recently. 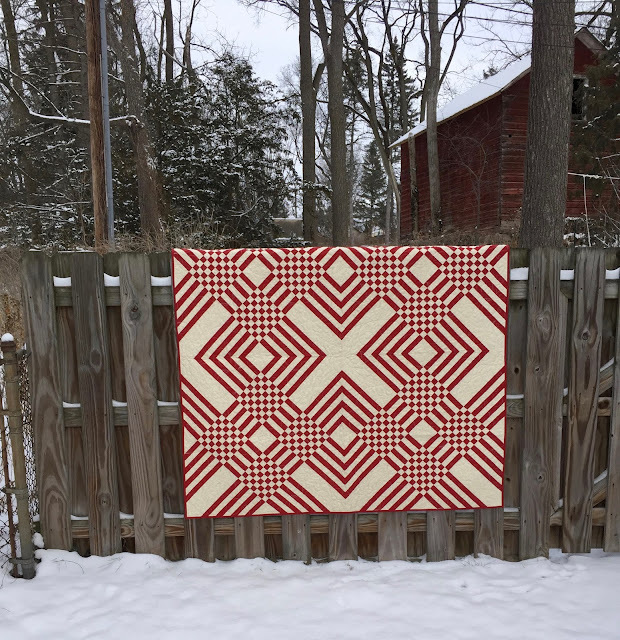 The Rowdy Flat Library Quilt designed by Susan Smith. It was great fun to work in a completely different color palette. Picking up Fat Quarters over a year of traveling was inspirational in itself. I always get inspired in quilt shops. If you would like to take this journey - we now have the Rowdy Flat Library Quilt pattern in our Etsy store. Of course, when one journey ends, another begins. A whole new attempt to whittle down my Minick and Simpson scraps started this week - the Hexagon Star A Day quilt by Somerset Patchwork. 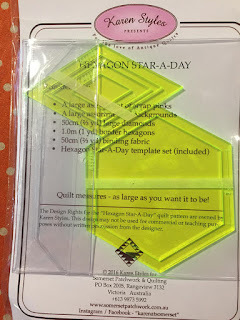 We also have this pattern in stock too. And this is another in-process quilt...... Thimbleblossoms Scrappy Stars quilt. You can get this pattern directly from Thimbleblossoms or your local quilt shop. This was made entirely from my scrap bin. You'd think it would be depleted, but you would be wrong. We're off to Texas in a few days where I hear it's a bit warmer. Right now I'm trying to strategize how to sterilize the entire airport and airplane before I travel. I'm feeling pretty good right now and I'd like to keep it that way. The Farmhouse Red fabrics will be in stores soon and I'll show you what I made with them.